Looks nice, doesn’t it? Usually in these reviews I open by rambling on a bit about personal experiences with the car in question, but since I’m not a millionaire that won’t happen this time. 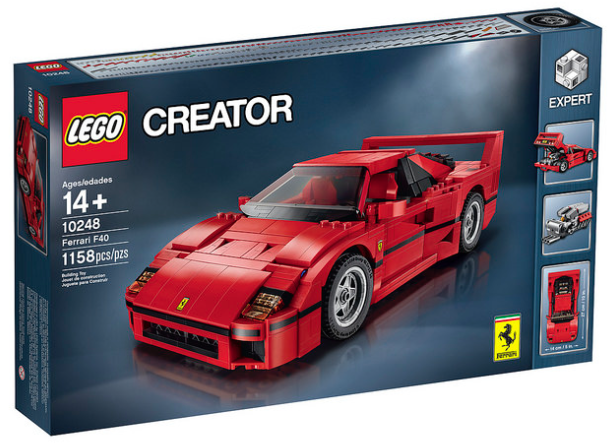 The Ferrari F40 is an amazing thing, and hardly a people’s car like the other Lego Creator sets… except it is. It’s a thing that’s a joy to see (and hear) whether you own it or not. Three cheers for those who do and share them with the world by driving them around! If you ever see one behind you, wind down the window and hope he gives it the berries when he comes fanging past! So, if you can’t get a real one, is 10248 the next best thing? At £70 for 1158 pieces it’s better value, certainly… better value than the Mini even, with 80 more pieces for a fiver less. 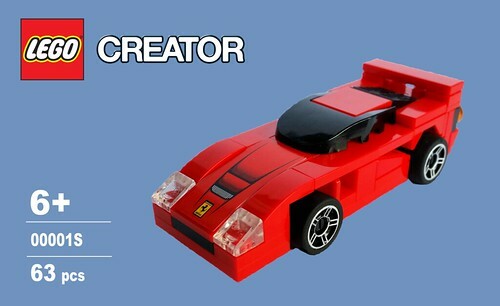 Considering the likely cost of the Ferrari licence, LEGO are being pretty generous here. Instructions are pretty clear, so long as you realize Lego’s inconsistent representations of dark grey and black result in what could be black parts in the early stages actually being dark grey… Another minor niggle is the usually-helpful highlighting of parts just added occasionally obscures some parts already there, which can create confusion. No biggie. It’s a fun thing to build, with very little repetition and like the Mini and Camper before it, plenty of interesting techniques and details along the way. I especially like the way they did those NACA ducts on the bonnet and sides. Here’s a fun fact: the duct was developed in 1945 as a way of allowing cooling air in with a minimal disruption to airflow, by the National Advisory Committee for Aeronautics in the US (NACA eventually became NASA when it’s remit expanded just a bit). As for the rest of it, it’s mostly very good, starting with the engine. The heart of any Ferrari, of course, and this has had plenty of attention lavished on it. 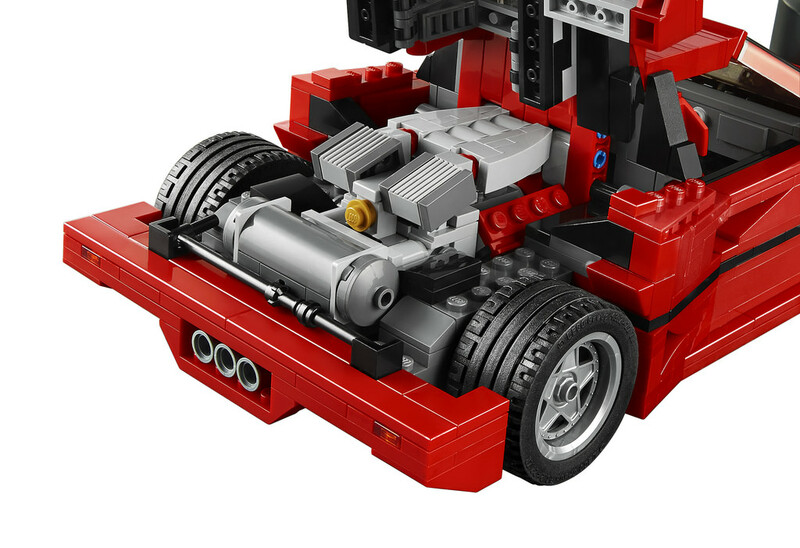 The 2.85L turbocharged V8 isn’t the prettiest Ferrari engine but it ain’t exactly a diesel either… LEGO have done a great job of this, right down to the pistols used as manifold outlets that you can barely even see once it’s in the car. They probably shouldn’t have printed the rear pillars. This is the only area that lets it down somewhat. Apparently the genius responsible for the camper’s front and the Mini’s A pillar is yet to retire… One issue I have with this solution is the fact that printing in red on a black part results in a darker shade of red, a point that’s not evident from the pictures on the box but does stand out on the model. Also, because the side window / pillar is one big part, the side window lifts up with the rear cover. Any MOCer worth his salt would have bricked this part properly, as LEGO themselves did with the rest of it. While we’re having a moan, do you ever wish that LEGO would stop unnecessarily redesigning parts? I’m talking here about the 1×6 arches used over the rear wheels that have an awkward little step that isn’t there if you use a couple of older, smoothly curving ones instead. It looks a lot better if you do. I am now done moaning. I’m not even going to complain about the stickered ducts over the rear wheels, simply because there isn’t a better way that I can see to do this with an opening engine cover in the space available. 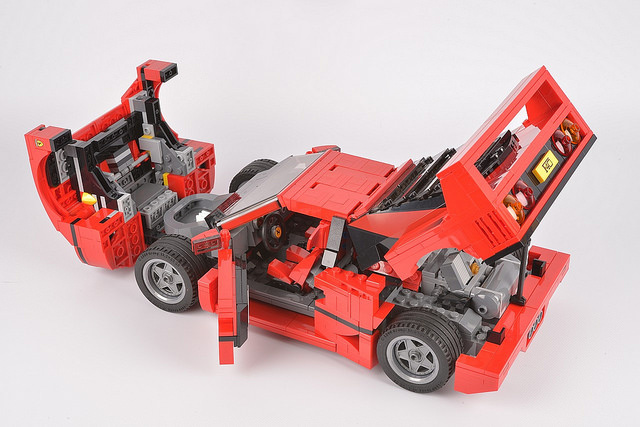 The front end is more successful, capturing the form of the F40 in bricks accurately and well. The pop-up headlights are quite neat (you have to lever them up individually yourself using a thin gap at the front – luckily they’ve provided the brick separator you’ll need for this!). The shape of the bonnet is excellent and there’s even a bit of detail under it, including a spanner (what are they trying to tell us about Italian reliability?). While you’re in there you might notice the multicoloured structure of the bonnet’s underside – the only place where the hidden BOLOCsness of this model becomes evident. And then there’s that windscreen… Manna from heaven for MOCers, surely! Just so long as the car you build with it is red… There’s a slightly surprising omission here, since with a 1×4 black brick right below it at the same angle, a simple substitution provides somewhere to place a wiper. After all, they’ve thought of everything else, including door mirrors that are actually attached to the doors. Hooray! All the panels that should open, do, which we always like to see. The engine cover pivots on an axle so there’s no friction – you’ll need the handy stick provided to hold it up. I guess Ferrari must have done the same. Aside from opening stuff and peering at detail, there’s no playability here, as with the other cars in this theme, but I’m pretty sure any attempt at stuffing mechanics in would ruin it. Like the Camper and Mini before it, it exists for display and it looks good enough to do that; it’s one visual flaw not quite enough to detract from the whole. If you have petrol in your veins you’ll like it. 8/10.